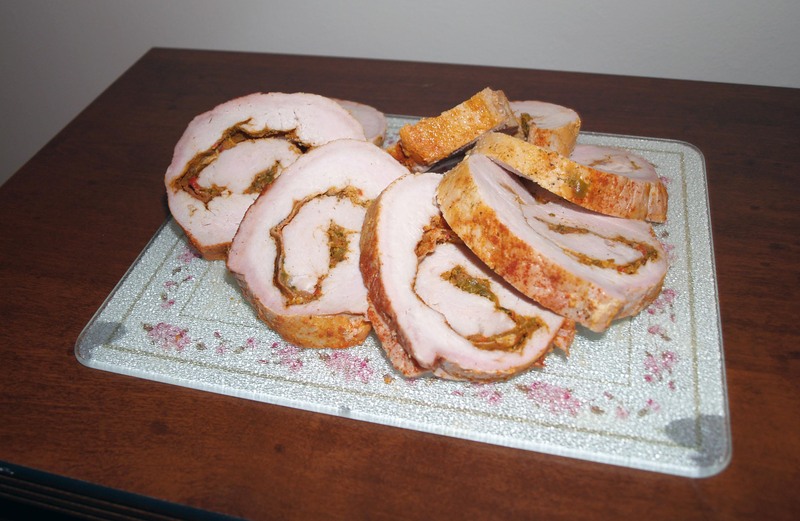 Spanish Pork Roulade | I Wanna Bake! I got knocked off my feet last week by a particularly nasty cold, so I was in no shape to get very far out of bed, much less bake anything this weekend. Fortunately, I’ve been sitting on the recipe for this Spanish pork roulade I invented since last November. I made it for the first time for a dinner party (flying blind is a nerve-wracking thing to do), and I thought it was a success. This was fortunate, considering I made way too much and was eating leftovers for weeks. In case you didn’t know, roulade is just a fancy word for a jellyroll made with meat instead of cake (doesn’t roulade sound so much more appealing than “meat jellyroll”?). I don’t know how I got the idea for rolled pork in my head, but once it was in there, it would not leave. I had already decided to make my version of arroz con pollo for this dinner party, so Spanish flavors just made sense. Unfortunately (or perhaps very fortunately), I couldn’t find any pork tenderloin recipes that incorporated all the right elements. Plenty of Italian pork roulades and bracioles, plenty of barbecue pork, even some fruity Hawaiian-style recipes, but no Spanish. Hopefully this recipe will fill that need for the next person who has a burning desire to roll up some pork with spicy goodness. Since I didn’t have much of a template to follow, I picked some Spanish flavors (smoked paprika, sofrito, and pimento) and rolled with it (get it? :-P). If I had wanted to slavishly stick to my Spanish theme, I probably should have used jamon serrano instead of prosciutto, but that’s just a bit too much effort for me. My great aunt makes sofrito herself and I’m sure my grandmother did too, but I’ve never tried it myself, so I just bought a tub of Goya’s in the frozen food aisle of the grocery store. If you can’t find sofrito, you can also use recaito. Both should be available frozen or in the international foods aisle. Now it’s confession time: I don’t own a meat tenderizer. My mother used to pound meat with a dead blow hammer, so I guess I’m just used to the kitchen not having one (and I refuse to pay what they inevitably cost). Still, the meat had to get flattened after it got butterflied, so Josh suggested just punching the meat. Believe it or not, it worked, albeit a bit slowly. We also tried rolling/hitting the meat with a rolling pin, but in the end, bare knuckles won out. Maybe in the future I’ll invest in this thing. I honestly don’t remember what I listened to when I made this because it was too long ago. Since I just got a new Charles Mingus cd for my birthday last week, I’m going to suggest that. Go ahead and git it in your soul! 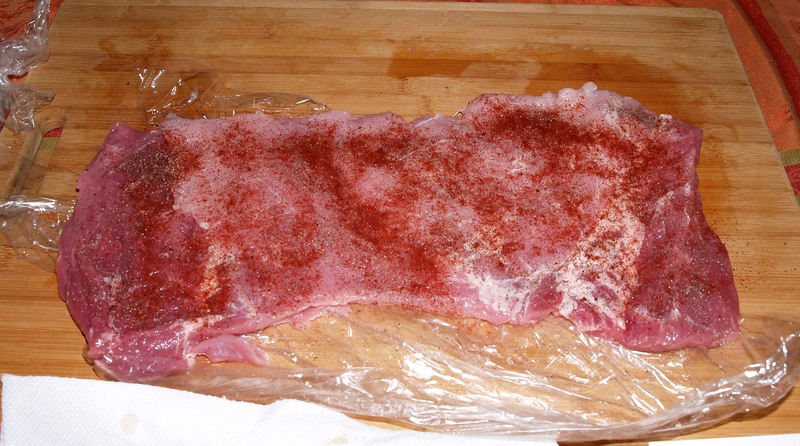 Remove the pork tenderloin from the package and cut away any fat or silver skin. Rinse and dry the tenderloin. 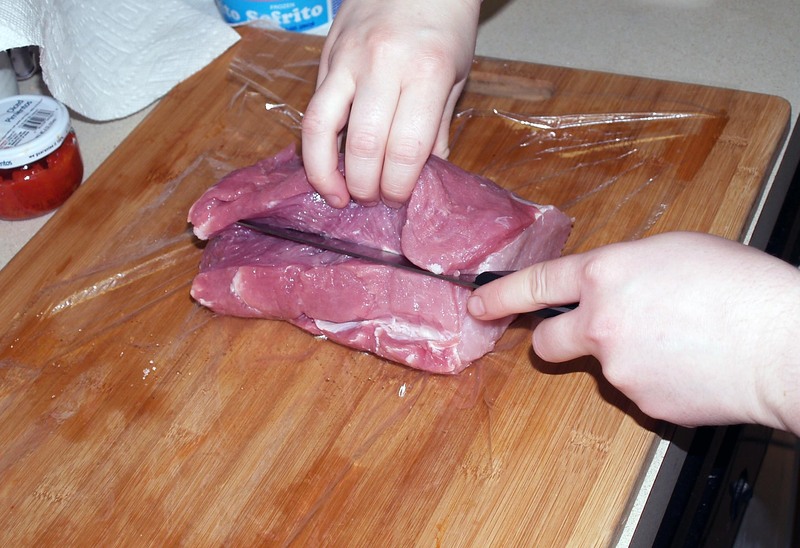 Cut the tenderloin in half and lay one half on a cutting board vertically on top of a sheet of plastic wrap. Holding the knife blade perpendicular to the counter, slice the meat down the center. stopping about ¼” short of the end. Open the meat up like a book. If there is additional fat or silver skin inside, remove that too. 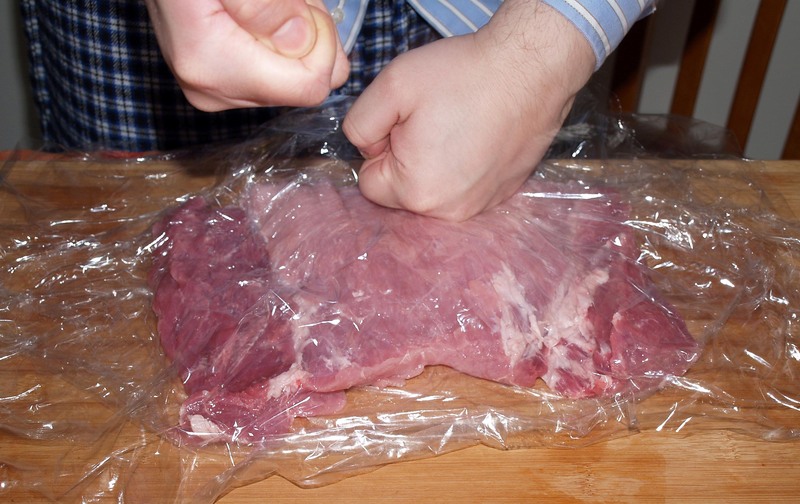 Put another piece of plastic wrap on top of the sliced meat and pound it with a meat tenderizer or your fists until it is at most ½” thick. 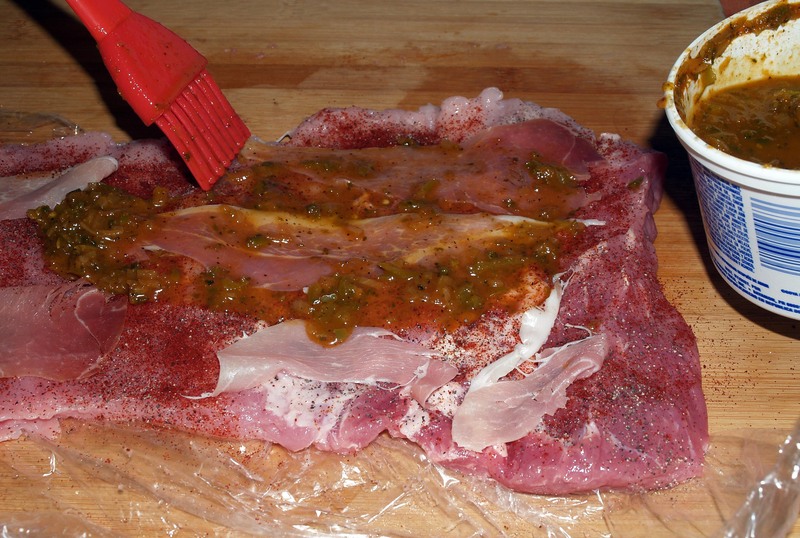 Remove the top piece of plastic wrap and sprinkle the meat evenly with salt, pepper, and smoked paprika. Lay slices of prosciutto on top of the seasoning. 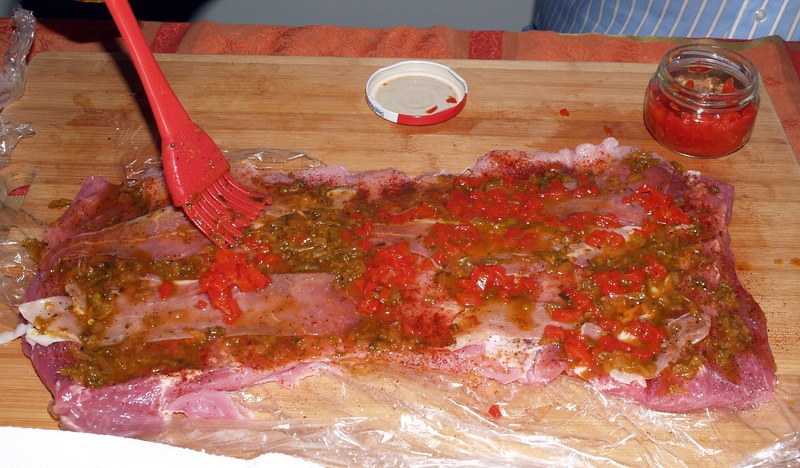 Spread a thin layer of sofrito across the surface of the tenderloin (I used a silicone brush). Sprinkle the pimentos evenly on top of the sofrito layer. 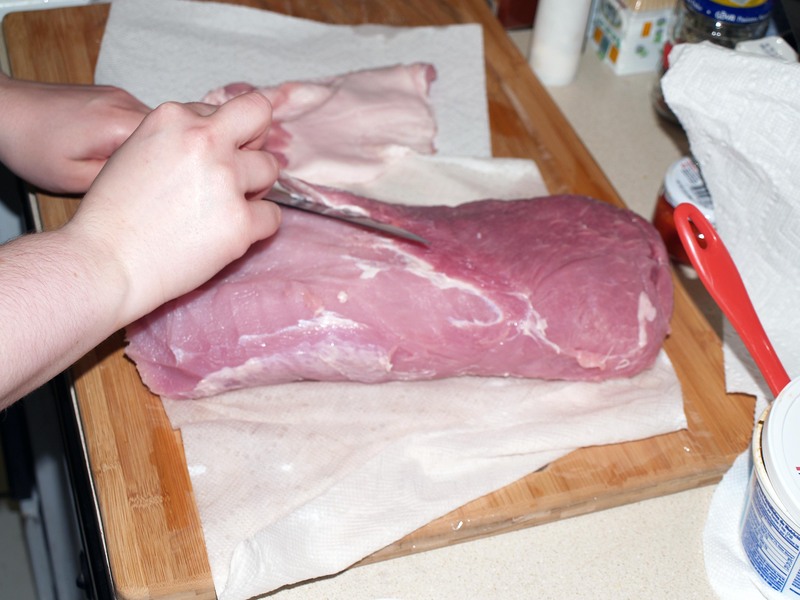 Starting at the shorter end, carefully roll the meat into a log. You can use the piece of plastic wrap underneath to help keep it tight. Tie the log with cooking twine at even intervals to help hold it together. Repeat the process with the other half of the tenderloin and transfer the meat to a roasting pan with a rack or a greased baking dish. Sprinkle with more smoked paprika. 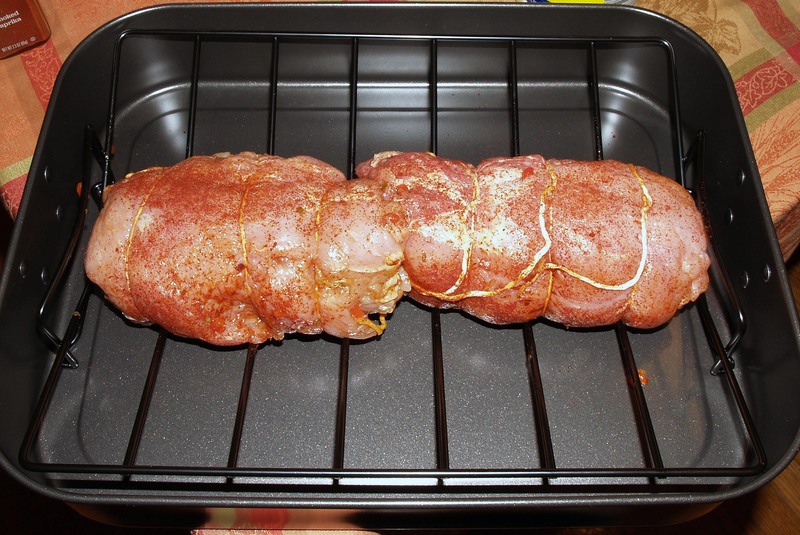 Bake the pork roulade for 1 hour 15 minutes, or until a meat thermometer registers 145°F. 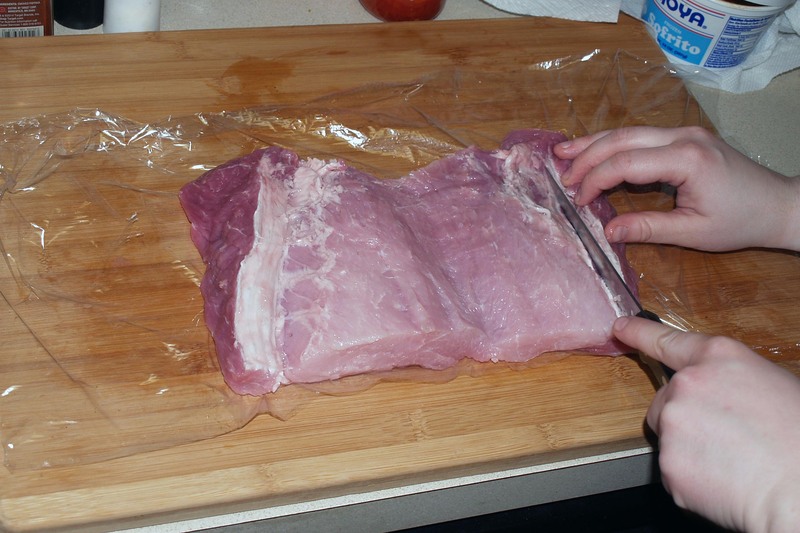 Remove from the pan and let the meat sit on a cutting board for 15 minutes under a covering of foil. This is a good time to remember you wanted to make a salad. When the meat has had a chance to rest, slice it into discs approximately 1″ thick and serve. You can use the juices remaining in the pan to make a gravy if desired.